Clapham is a small attractive village just within the wonderful Yorkshire Dales National Park. The village is nestled at the base of Ingleborough, one of Yorkshire’s Three Peaks. Clapham Beck which flows through the centre of the village starts near Ingleborough Cave, runs along Clapdale Drive into a lake, over a waterfall and through the village passing under four bridges (two footbridges and two road bridges). Clapham is home to the Farrer family whose Ingleborough estate was established in the 19th century. The family own and is responsible for most of the land, fields, woods, walls and the moors of the beautiful countryside which surround the village and its farms. The church of St James was founded in Norman times and originally dedicated to St Michael. The village and church were burned during a Scottish raid following the Battle of Bannockburn in the early 14th century. The Medieval tower remains but the rest of the church dates from the 19th century. Clapham contains some solid stone cottages and a pub, the New Inn that has been providing a stopping place for visitors since it was built as a coaching inn in 1776. The village also has two cafes, a few shops, a community store and post office, a few B&B’s and also a caravan and camping site situated just outside the village near Clapham railway station. Ingleborough Estate Nature Trail was set up in 1970 to mark European Conservation Year and also to commemorate Reginald Farrer who was a botanist and plant collector. He introduced many alpine species from China, Tibet and Upper Burma. One of his many books ‘The English Rock Garden’ earned him the title of ‘The Patron Saint of Alpine Gardening’. Along the route there is also an amazing collection of rhododendrons. The entrance was re-opened in spring 2008 to separate pedestrians from the workings at the sawmill yard and also to provide some disabled parking and safer access for children. There is a small charge, by way of a ticket machine, to walk along the trail. At the end of the trail the path continues to Ingleborough Cave, Trow Gill, Gaping Gill and Ingleborough. Ingleborough Cave is a show cave adjacent to where the water from Gaping Gill reappears. The show cave is open to the public and a guide will lead you through a fossil gallery for about 500 metres (1,640 feet). This underground world of many beautiful stalagmite and stalactite formations has been sculptured by nature over millions of years. A small stream in the show cave drops into a rift called the Abyss. From here the fossil gallery continues to meet the main stream. The water can be followed upstream through passages under Trow Gill to where it emerges from a sump at Terminal Lake which has been connected by divers to Gaping Gill and followed downstream into Lake Pluto which has also been connected by divers to Beck Head Cave. An underwater connection has been made between the passage at the bottom and Beck Head Cave, the resurgence for the Gaping Gill Water. The passages are floodlit with well laid concrete paths and there are no steps so is accessible for pushchairs. The cave is open most of the year and is host to Santa’s Grotto at Christmas. Trow Gill is a wooded limestone ravine at the head of Clapdale. It is now a dry gorge but was maybe once an underground cavern formed by waters which now take an alternative route through the Ingleborough Cave and Gaping Gill system. It is said that Trow Gill is possibly the result of the roof collapsing at some point in this cavern but other theories say it is a glacial meltwater channel of the Ice Age. Gaping Gill is a famous 100 metre deep pothole on the limestone moors on the flanks of Ingleborough. Please note the edges of the pothole are unstable and extremely dangerous and can become very slippery especially in wet weather, the shaft is only open to experienced potholers. 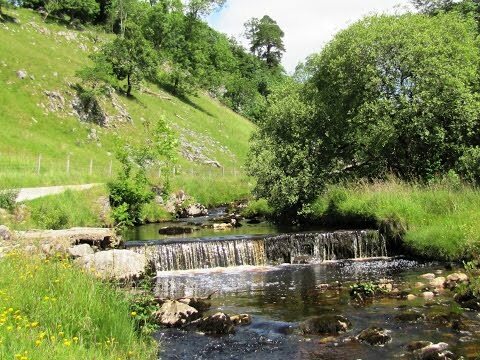 Fell Beck, the stream that crashes down into the pothole is Britain’s highest unbroken waterfall and the largest underground chamber naturally open to the surface. Fell Beck which starts on the high slopes of Ingleborough, eventually reappears as Clapham Beck at Beck Head Cave a short distance from the main dry entrance of Ingleborough Cave. The first attempt to descend Gaping Gill took place in 1845 when John Birkbeck of Settle was able to reach a ledge about 55 metres (180 feet) down the shaft, now known as Birkbeck’s Ledge. It wasn’t until 1895 when the shaft was fully descended for the first time by the French speleologist Edouard Alfred Martel. He achieved this using a rope ladder and with a candle for illumination. 100 years later in 1995 the Bradford Pothole Club celebrated this achievement by descending the pothole in period costume and using 100 metres of purpose built wood and rope ladder. The Yorkshire Ramblers Club was next to visit Gaping Gill in 1896. They lowered cavers into the main chamber via a pulley system, and explored the main chamber, discovering Old East Passage and West Chamber. In 1908 the Yorkshire Speleological Association discovered South Passage and many of the other passages in the vicinity. They also discovered a new entrance into the system, Flood Exit Pot. There are ten other entrances into the Gaping Gill system. After many years of exploration the connection between Gaping Gill and Ingleborough Cave was finally realised in 1983 by teams of cavers from the Bradford Pothole Club and Cave Diving Group. A detailed 3D model of the chamber has been created using an industrial laser rangefinder which showed that its volume is comparable to the size of York Minster. For a fee the public can be lowered down into the main chamber of Gaping Gill and back up by means of a platform and winch set up above the shaft. This happens twice a year by the Bradford Pothole Club around Spring Bank Holiday and the Craven Pothole Club around August Bank Holiday. We turn right out of the car park and follow the road to the church. We turn left to over the bridge then turn right and head forward to the entrance of Ingleborough Estate Nature Trail. We pay the small fee as we go through the gate then following the track passing the lake on our right also with Clapham Beck on right until we come to a gate. We go through the gate this is the end of the trail, into the open. We continue following the track and we soon arrive at Ingleborough Cave. After a visit into the cave we turn left over the footbridge and continue following the path through a two gates. We start to go uphill and after a short way we climb up through Trow Gill. At the top we head forwards following the path with the wall on our left. After about 5 minutes we turn left over the double stile in the wall. We head forwards on the level following the path. When the path splits we take the right path and head forwards to the fenced off area. We are now at Gaping Gill. We go round the other side and take the steps down to have a closer look, please take care here especially with children and dogs. We then retrace our steps back to the double stile in the wall. We now head forwards uphill on the grass path. As we head downhill the path bears left and then about 100 yards from some rocks with a tree growing out of it we bear right downhill to the bottom and take the path opposite uphill towards a gate. At the gate we see there are two gates we take the left one with the blue arrow. We head forward downhill on the track called Long Lane with the wall on our right. We eventually come to some trees and a t-junction of tracks. We turn right and after a short way we go through the wood steeply downhill which takes us back to the church. We turn left and make our way back to the car park. This is a moderate walk on tarmac minor road, good gravel, stony and grass paths and tracks. There some steep inclines and declines. Elevation: approx lowest point 165m(514.4ft) approx highest point 406.2m (1332.7ft) approx total ascent 317.7m (1042.3ft). Approx 5.9 miles allow 3 hours using OS Explorer Map OL2, Yorkshire Dales Southern & Western areas. Start point: the car park in Clapham. Clapham is in the Yorkshire Dales. From the A1(M) take junction 47 onto the A59. Follow the A59 through Knaresborough, Harrogate and Blubberhouses then continue straight over three roundabouts to bypass Skipton. Then at the fourth roundabout take the third exit onto the A65 to Gargrave. Continue on the A65 bypassing Settle. Then take the B6480 on the right to Clapham. On entering Clapham take a right turn to the car park which is on the right. Parking: Pay and Display car park and free road side parking. There are public toilets in the car park and for refreshments there is the New Inn public house, two cafes and a little shop and post office in Clapham.